So often when trying to understand God’s call for my life, I felt like His plans for me were elusive and intangible. In reality, I had placed obstacles in my own life that made it hard to hear what He was so patiently and clearly telling me. 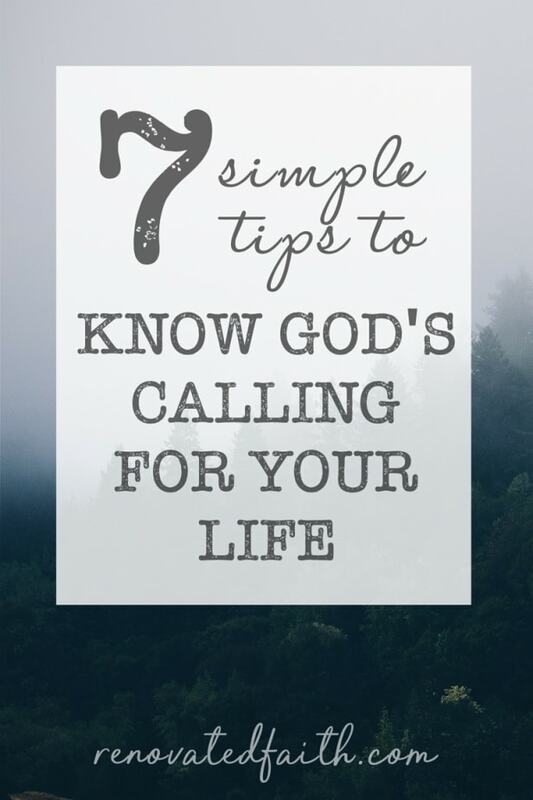 In this post, I’ll share ways to better identify where He is calling you and hear His voice with these 7 tips on how to find God’s calling for your life. The angel responds to his lack of faith by taking away his voice until the day of John’s birth. In other words, believe God when He tells you to do something the first time. Don’t spin your wheels by questioning Him but be obedient to the last thing God told you to do – even if you don’t understand it. He will be sure to show you the next step in His perfect time. C.S. Lewis once said, “True humility is not thinking less of yourself. It is thinking of yourself less.” Pray for God to redirect your focus to “HIS WILL” instead of “his will for ME”. 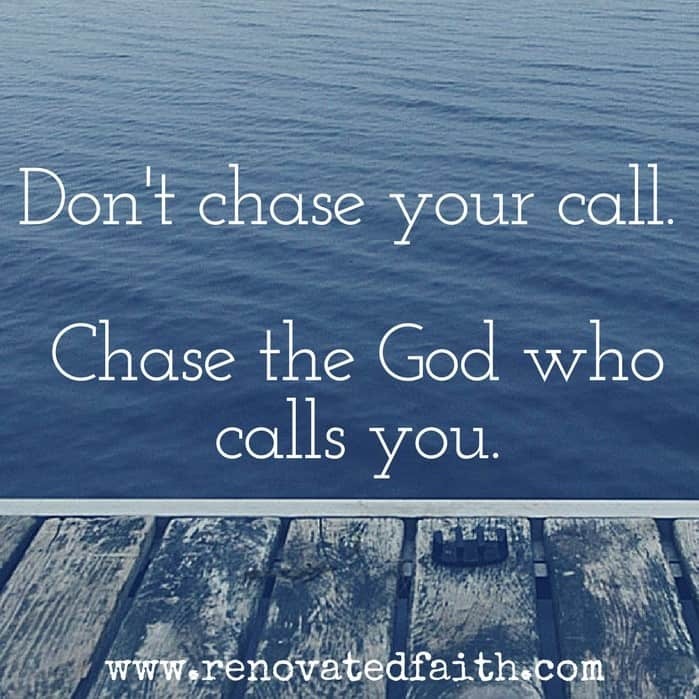 Don’t chase your call but chase the God who calls you. Sometimes God gives us the greatest blessing in the unexpected. Be open to the fact that following his calling might take a course correction. As I wrote about in my experience with my last job in church ministry, God might be preparing you for something that has never even been on your radar. God is our only source of power and strength so if we focus on ourselves, even while trying to do good things, we will surely fall flat on our face. God has given us each different gifts and talents but without His power burning bright in us, we are like a candle without a flame. A candle can have a uniquely colorful glow and aroma, but without the flame, it cannot fulfill its true purpose of providing light. In the same way, it can be tempting to focus on the tips and talents of others but as I mention in my post 5 Ways to Stop Comparing Yourself to Others, we have to focus on God’s calling for us. Like a horse with blinders, we will eventually follow the direction of our focus. 3. You Have Gifts and Talents – Use Them! There are various spiritual gift surveys online including this one that can give you an idea as to what your God-given gifts are. In addition, be aware of your talents. Maybe you are great at decorating, gardening or baking. Perhaps God wants you to combine your gift of encouragement and baking skills to make gifts for neighbors as a means to reach out to them. God you your gifts and talents for a reason and He delights in seeing you use them. 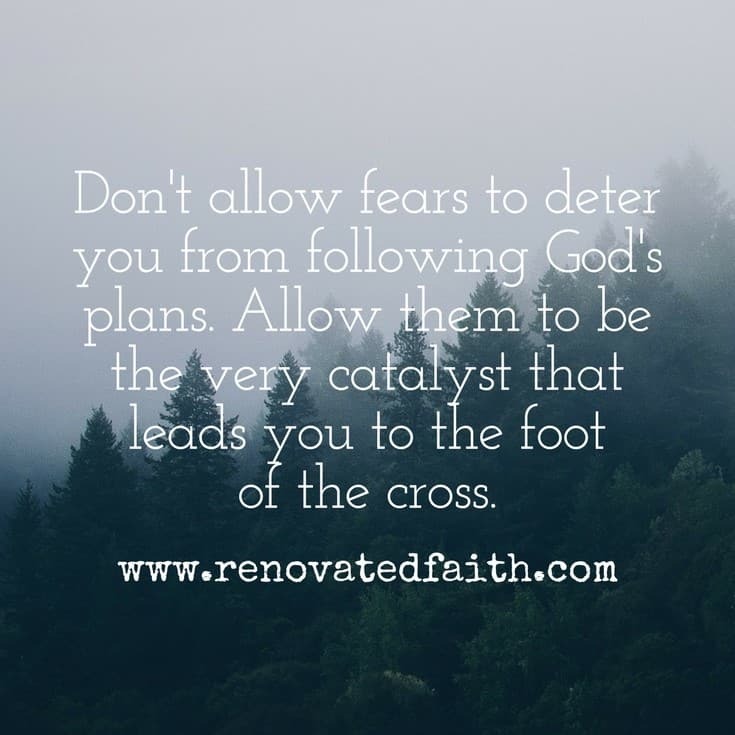 Don’t allow fears to deter you from following God’s plans. Allow them to be the very catalyst that drives you to the foot of the cross. Be mindful of fears when they come into your thought life. Take those opportunities to not only hand over the fear to God in prayer, but to submit the entire situation over to Him. For example, maybe I realize I am nervous about a meeting with my daughter’s teacher. Instead of giving just the fear over to God in prayer, pray to give the entire situation to Him in prayer. Let your fear be a prompt or reminder that highlights opportunities to allow God to intercede through you as you give the entire situation over to Him. In most sports, there is that feeling you get…just like when you hit a tennis ball on the sweet spot of your racket. You get a good spin on the ball and you know the racket was used exactly how it should be used. Always be watchful for that same feeling. When you find yourself in the middle of a task, hobby or job and notice that same satisfaction, know that you have found the point where your God-given talents align with the tasks He has laid before you. When you approach the point where your gifts and calling intersect, have found your sweet spot. 6. Be tenacious in pursuing your God-given goals. Sharpening our gifts and talents will take work. Within the work lies the preparation, growth and character-building that will be necessary when His plans are fully realized. Development is part of the process because God wants us to make sure we are ready for all He has planned. It’s through working towards our God-given goals that He prepares us for the task at hand. 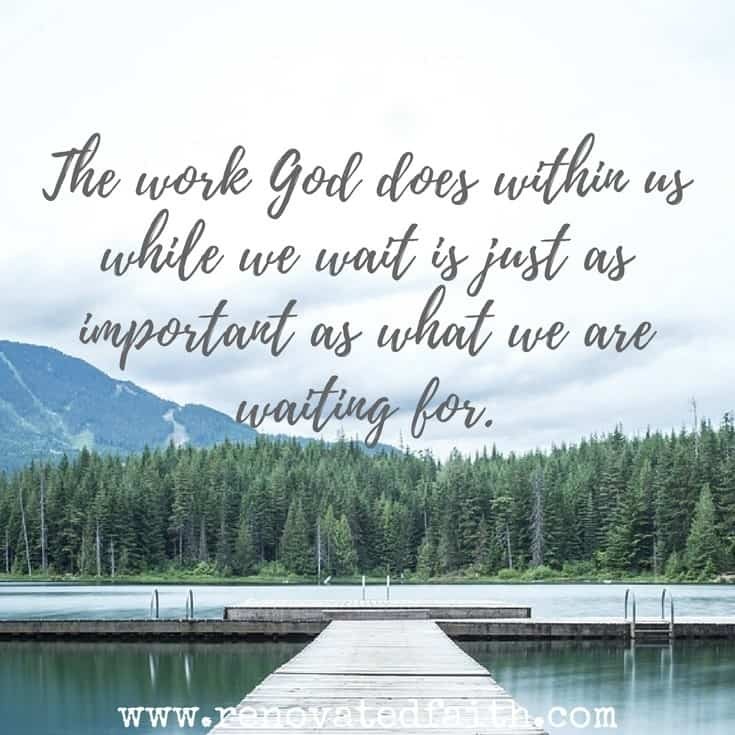 The work God does within us while we wait is just as important as what we are waiting for. My favorite verse is 1 Corinthians 2:9, which states, “No eye has seen, no ear has heard and no mind has conceived what God has planned for those who love Him.” Know God has plans for you that are so much greater than anything you have imagined. Which tip was most helpful in how to find God’s calling for your life? I’d love to hear feedback and your tips below! Such a great line: Don’t chase the call, chase the God who calls you. What a fantastic line and a great post on finding God’s calling on our lives! Thank you for your kind words Erin! It has helped me in understanding the struggles I have been going through. I feel a great weight has been lifted from my shoulders just by reading your post and the scriptures that you use to help demonstrate how much we all can achieve by asking God for direction in our lives. Thank you for your sweet comment Gayle. I was there not long ago myself so I understand how frustrating it can be. I’m so happy to hear a weight has been lifted off your shoulders. Know that you are God’s workmanship created for a special purpose by the Creator of the whole universe. Have a great week and praying for God’s direction in your life. 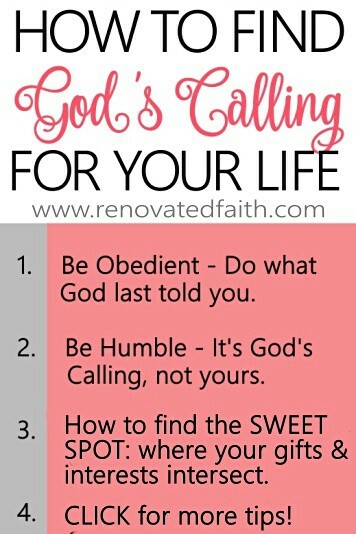 Outstanding tips to move forward in God’s call. It can be scary but I think we can both attest to the awesome things that take place when you are obedient. Cast fear aside and take hold! Karin – I love these tips, it can be so scary to step out in faith, but when you keep your eyes on Him it makes all the other stuff fade and takes all the pressure off you. So glad you are walking in that faith! Love your blog!